The port town of Galle, about 60 miles (100km) south of Colombo and a short distance west of Matara, is steeped in the heritage of the Dutch presence in Sri Lanka, and is dominated by the 36-hectare (89-acre) Dutch Fort, built in 1663, with its massive ramparts on a promontory. Galle is a delightful and unexpected mixture of dilapidated colonial history and exotic, tropical beauty. Inside the walls of the fort, which has been declared a UNESCO World Heritage Site, is the oldest part of Galle, with Dutch homesteads, museums and churches, as well as the New Oriental Hotel, originally the home of the Dutch governors. Galle is home to a creative community and has attracted many foreign artists, writers and poets. Inside the fort there are many galleries, boutiques and craft shops to investigate, and many travellers choose to spend a few nights in the fort, which is at once an interesting historical monument and a thriving modern centre. 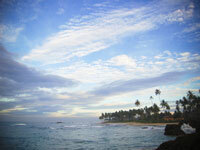 Galle has a small beach, but most sun-lovers find better beaches a little out of town along the coast road. Getting to Galle from Colombo is a treat, because both the train and bus routes wind along the coast, offering gorgeous views. It takes between two and four hours to get to Galle from the capital by bus or train.